It’s a little-known fact that Ben Affleck – celebrity totty, tabloid bait and esteemed filmmaker – has a degree in Middle Eastern affairs from the University of Vermont. It’s a qualification he puts to good use in ‘Argo’, a nail-biting thriller based (fairly loosely) on real events which, for the majority of its length, manages to avoid the expected Hollywood clichés about the Middle East and promote a balanced view of America’s dealings with that troubled region. 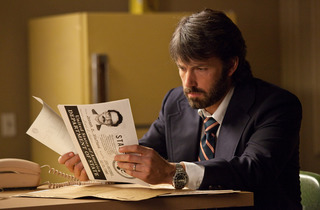 For 100 minutes, ‘Argo’ is close to flawless. Unashamedly modelling his directorial style on the stark, serious ’70s thrillers of Alan J Pakula and Sidney Lumet, Affleck cranks up the tension expertly. The script is witty and insightful, contrasting US and Iranian popular reactions to the crisis: it’s ‘Death to America’ versus ‘Ayatollah Assaholla’. There’s not enough attention paid to character development – Mendez, in particular, never comes into sharp focus – but that was true in the Pakula/Lumet films, too, and it’s mitigated by a superb cast, notably Alan Arkin as an irascible Hollywood old-hand. I was only 4 years old when the events of this movie kicked off. I never really knew the history of how the US pretty much overthrew the leader in Iran and pretty much cause a whole load of conflict there. When the angry mob wanted the US our and attacked the embassy, 6 of them got away and went into hiding, and this movie shows the audacious plot to rescue them by going in as movie producers, giving them new ideas for a set recce and then getting them out on a plane under the noses of the officials who, if they catch them, will shoot them as spies! Gripping and well acted, this is a movie that will have you feeling tense from start to end. I don't really know why it took my this long to actually get round to watching it! Nothing really happens in this film, also i feel asleep half way with being so bored. It's definitely an absolute thriller superbly crafted and executed by Ben ! Forget the history . Go and watch the film ! This is an interesting if flawed film. I thought the potted history of Iran and the interfence in its affairs by both Britain and the US at the start of the film was useful. For many in the audience it must have been an eye-opener. The story that succeeds it is tense and compelling. Yet it's accompanied by a sense of US triumphalism that contradicts the content of that opening. As I understand that the final departure went without a hitch the last minute action sequence came across as very phony. Still it held my attention and there was some sharp dialogue. 3 stars. Only 3 things to say about this movie - Fabulous, Fabulous & Fabulous. Definitely go see it! A very enjoyable, well made film. Gripping throughout with some good performances from the ensemble of top actors. The title scene at the start was a nice retro touch. This is a very, very good and entertaining film. The plot is tight, suspense is maintained throughout keeping you on the edge of your seat and the film is well scripted and well acted. This more than makes up for having made the mistake of seeing The Master recently, which was as awful as this was entertaining. Definitely 10 out of 10 and 5 stars. Interesting, fluid mix of drama, thriller, history and (in the Hollywood segments) comedy. Oddly enough, I agree with most of the 'user review' comments here, both good and bad: Argo is a well made film with great screencraft. Affleck can direct, there is lots of atmosphere and period detail. I found it gripping. There are some good performances, some less so. Character development is limited, The ending is cliche. So far it's nudging up towards a 4star rating! But this is not a story that needed to be told. If Affleck wanted to do a credible piece on the CIA in Iran, there's decades of their support for the Shar and his death squads to draw on. So why this? The first half was great, until the distasteful political subtext put me off. blimey scrumpyjack agrees with me ... wheres the prozac ? To enjoy this work one must view it as a film not a documentary. It's drama. It's fiction based on fact.It's a lie well-told. It certainly sustains the viewer's attention. It's hardly boring. Well-structured story, very well acted and cleverly written. Maybe not to everyone's taste but if you read the reviews, watch the trailer you'll have a good idea if you're likely to enjoy it. It's not the best film of the year but it is certainly very good and well worth a visit to the cinema. 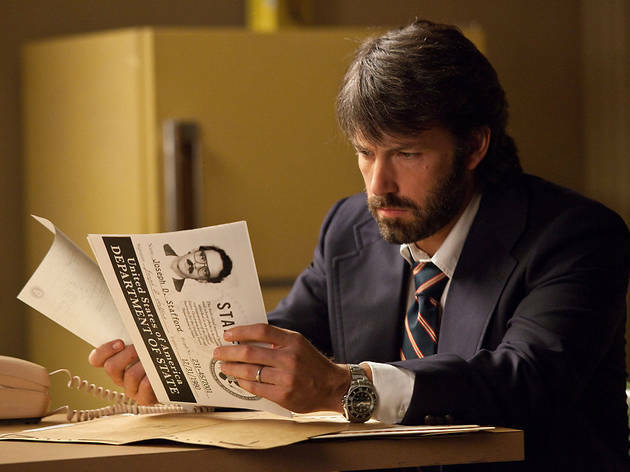 The ever so reliable Affleck does it yet again with "Argo": a film that entertained me boyond it's absurdity and historical ambiguity: A pleasurable experience all round. Props to Ben Affleck for delivering a sublime hat trick with "Gone Baby Gone" and "The Town". Once a blip under Matt Damon's radar, now an assured director. Exactly what MikeT said. I'd like to add that this is nowhere near 70s Lumet or Pakula's league - that's just lazy journalism making an easy comparison. This is a bland, tepid movie: full of boring Hollywoodisms [nauseating score, dull redemptive character arcs, mild racism]. It's not bad, it's just horribly over-rated. | Also interesting to see Affleck's character - who has been established as apparently being a bit of a drinker/on the skids/ out of shape etc - showing us his ripped, muscular chest and cancelling out all that character development in one shot. Anyone going to see this movie should be aware the trailers take at least 20-25 minutes, so I was a little bit bored before the film began to roll. If youâ€™re of a certain age (eg 40+), youâ€™ll have seen a fair few Middle Eastern / hostage / thriller type movies in your time. Affleckâ€™s choice of character types is very formulaic - right down to the nerdy nervous pain-in-the-neck who pulls through for the group when the chips are down. . I donâ€™t think this is a bad film, but neither is it great. Itâ€™s sure to turn up on TV on Christmas Day (2013). Alan Arkinâ€™s role should have been rewritten and made bigger once he was cast - he can knock spots off many of the cast and was very good in this. . Though I think "Argo" will get a few nominations (as Hollywood currently loves Bennifer), Iâ€™d be really surprised if this film won any major awards. For a thriller it wasnâ€™t that thrilling. I saw this at Cineworld Fulham - where the audience attention span is above average - and around the 1hr15m mark there were a fair few smartphones coming out, and two walked out. It was reassuring to see my opinion that Bennifer completely loves Bennifer has been maintained- he had himself filmed dressing in front of a mirror - something the movie didnâ€™t need, but Benniferâ€™s vanity clearly did. I would have given this movie three stars, but Benniferâ€™s nauseating vanity brings it down two stars. I agree re the rather cliched ending but apart from that this is an excellent film. Well made and acted and yes it does hark back to the classic 1970's thrillers. All around excellent acting and a real joy of a thriller. I will be very surprised if this doesn't get a best film and director nomination for Affleck. Also there wil be no justice if Arkin doesn't get a best supporting actor nomination. Go see. It is a good 4 star film with the poor ending sadly reducing a 9 out of 10 film to an 8 for me. A huge disappointment after Afflecks first 2 directorial efforts. A thin script - the satirical hollywood elements barely evident, a 'hero' and a bunch of hostages we don't care about and a ridiculously protracted escape finale. Excellent suspense drama, grips throughout from first frame to last. Great direction and acting from Ben Affleck, understated rather than showy. Lots of witty one-liners as well, notably from Alan Arkin and John Goodman. Will definitely be one of the favourites for Best Picture and Director at the Oscars.